The second session of the Pan-Arctic Climate Outlook Forum (PARCOF) to review the climate conditions during the previous summer season and to provide an outlook for the forthcoming winter season is forecasting above-average winter temperatures. The PARCOF is part of an international drive to improve weather, climate and sea-ice forecasts in a region that is undergoing rapid environmental change. It was attended by the member countries of the Arctic Council, as well as representatives from the Arctic shipping and indigenous communities. The Forum, which took place virtually at the end of October, was hosted by the World Meteorological Office (WMO) and coordinated by the Norwegian Meteorological Institute. The Forum said that the previous summer was warmer than average over the Arctic domain, with the exception of parts of Canada and central Greenland. This led to the minimum sea ice extent to be the 6th lowest on record since 1979. The outlook indicates that the average surface air temperatures are expected to be above normal for the entire Arctic for November, December and January. The fall freeze-up of sea ice is expected to be earlier than normal in Hudson Bay, Baffin Bay and the Beaufort Sea, and later than normal across most of the eastern Arctic. The March 2019 sea ice extent is expected to be below or near normal. 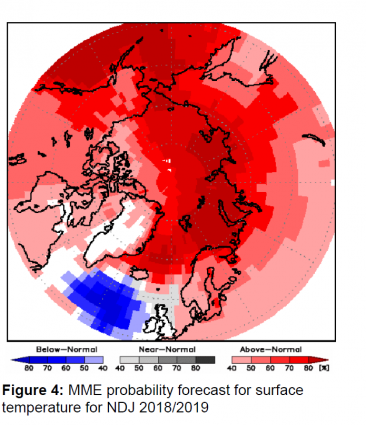 The reality of climate change and its impacts have prompted the decision to initiate Pan-Arctic seasonal predictions, based on collaboration via the well-known Regional Climate Outlook Forum process pioneered by WMO which is already a well established mechanism in most parts of the world. Seasonal predictions support climate risk management, climate change adaptation and inform policy and decision-making in climate-sensitive sectors operating in the challenging Arctic environment. Following the success of the first physical PARCOF session held in Ottawa, Canada in May 2018, the virtual event is a further step in the demonstration phase of the ArcRCC-Network towards designation as a WMO RCC-Network. ArcRCC-Network receives active contributions from all the Arctic Council member countries. PARCOF will be held on a regular basis and will continue to bring together the science community, key decision-makers and important partner organizations to discuss priority products for climate-sensitive users. All PARCOF sessions will include indigenous participation, as climate change impacts affect all aspects of their day-to-day life.